Last year our Christmas tree fell over – well, got knocked over, really – right after we had finished decorating it and were all sitting on the couch singing Christmas carols. Actually we weren’t all sitting on the couch. 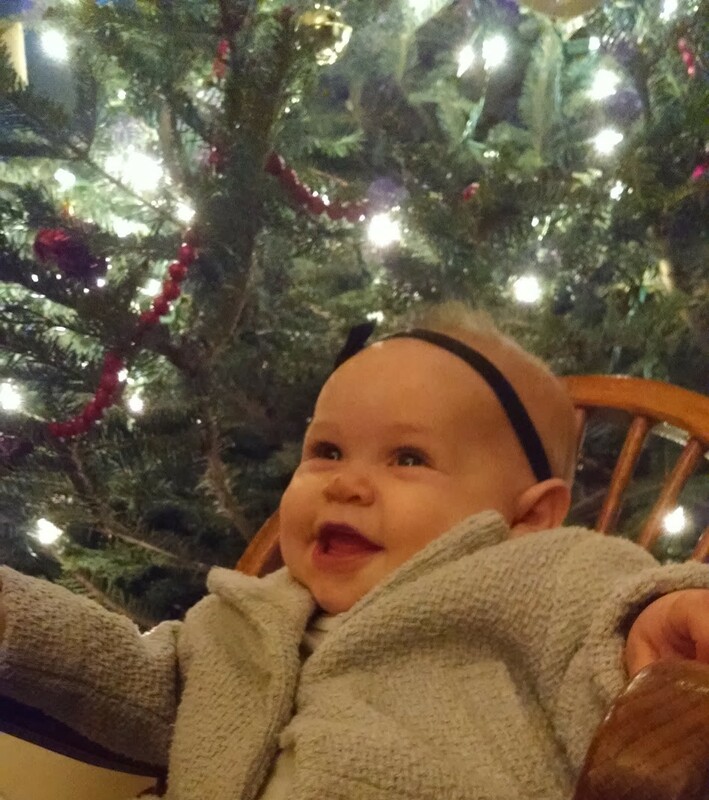 The baby was exploring the white lights and colorful balls and strings of beads when she pulled just a little too hard on a branch and….. CRAAAASH! Commence screaming, crying, and… blaming. This has become a habit around our house. Words like “See?” and “What did I tell you?” are quick to fly out of our mouths at the slightest milk spill or broken toy. I don’t think we are alone in this. The negative side effects of “karma” are everywhere in our culture. The philosophy that we are paid back according to our actions – good or bad – makes it next to impossible for us to grant each other grace. The spilled milk, broken toy, or crashed Christmas tree are all someone’s fault. Someone messed up, and now we are suffering the consequences. Blame and self-righteous blame-shifting are our default reactions to every mistake or failure. But there is an alternate reality just beyond my grasp… one that I am reminded of every December and spend the rest of the year trying not to forget. Like our Christmas tree, but a little longer than a year ago, heaven CRASHED into earth. God came to earth in human form, but without any of the sin-trappings of humans. He observed the bad: not just spilled milk, but hatred and murder, not fallen Christmas trees, but self-centeredness and pride, not broken toys, but broken relationships and trust. And instead of pointing his finger at us disapprovingly, he did something completely unexpected. The curse of karma is broken! To be precise… Heaven came down and knocked karma out. I no longer am held captive by all my [many] failures – praise Jesus – there is another solution! My blame-shifting can stop… I no longer have to hold myself to the standard of perfection. My solution is in Someone Else. He took my failure as his own, he paid for it, and he acquitted me. I may still have to clean up the broken ornaments on the floor, but I don’t have to pay the penalty for my sin. Heaven came down, and I am free. Ohhhhh that feels good. Relief from the burden of my sin – even my angry and self-righteous reactions to my children’s and husband’s faults. Thank you, Jesus, for entering our world, for taking the blame that belonged to me, and for paying the penalty I owed. I am forever thankful. May “Merry Christmas” carry special meaning for you this season, and may we learn to treat others with this same heaven-came-down kind of grace… the kind that seeks to lift rather than tear down, heal rather than wound, and that doesn’t hold anyone to a standard that none of us can achieve. Amen!! Grace cancels out the blame game! Yes!! Now if only I could remember to consistently apply this message to life…!! Heaven came down – I’m forever grateful! So many great songs that reinforce this truth. The newest one is “Here Comes Heaven” by Elevation Worship. Great Christmas song! Thank you for this rich doctrinal post! The song is from their newest collection.